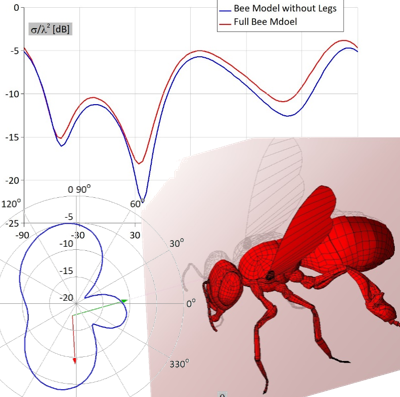 This application note presents efficient monostatic Radar Cross Section (RCS) simulation of a highly detailed CAD model of a bee. The simulation has been carried out by WIPL-D Pro CAD software product, offering CAD modeler and in-house developed quad mesher as well as Method of Moments based kernel. The body of a bee has been modeled as homogeneous dielectric with high Er. Due to all the realistic details included in the CAD file, the simulation is far more complex than for simple RCS objects of similar size. In the first stage, the full bee model is meshed into over 6,000 plates and simulated on regular desktop PC (any modern laptop or desktop will do). In the next phase, the long and narrow legs of the CAD bee model have been eliminated. The results indicate that such model shows excellent accuracy but is order of magnitude easier for the MoM simulation. All simulations are carried out with the inherent bee symmetry. Owing to the highly efficient in-house parallelization of matrix fill-in time (the dominant component in this EM simulation), the simulation on a standard desktop quad-core for the full bee lasts couple of minutes, while the no-leg model is run in seconds. In addition, owing to the GPU solver the simulation of a full bee has been speeded up for couple of seconds for a less significant part of the simulation time – the matrix inversion. Even a single inexpensive GPU card turns a desktop PC into a workstation allowing to solve problems with even 100,000 unknowns in reasonable time.